Arthritis pain limiting your movement? Don't let the dread of getting in and out of the car keep you confined. Try this instead: To get in, back into the seat and then swing in your legs. To get out of a car, do the opposite, swinging your legs out first. A beaded seat cover or a swivel seat, which can be installed, also make both maneuvers easier. Pushing microwave buttons, brushing your teeth, and even eating can be tough if you have osteoarthritis in your fingers. 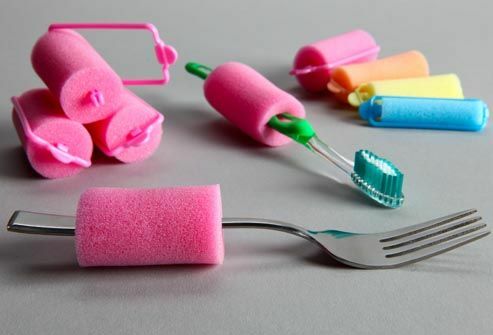 Try these DIY solutions: Slide cylindrical foam over your fork or toothbrush for an easier grip. (Large sponge hair rollers can be perfect.) Put a rubber stopper on the end of a ruler or a dowel. Use it to push microwave, television, and other buttons. 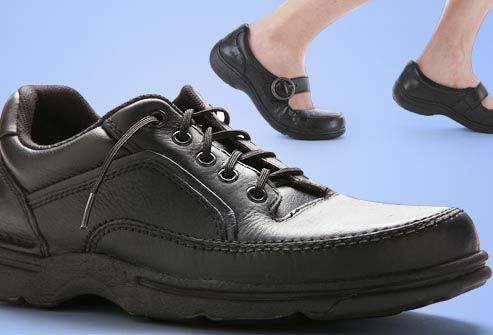 To stay active with osteoarthritis, you want shoes with good arch support and a cushioned sole. But if tying laces is difficult, you may be tempted to wear less supportive mules or slip-ons. The solution: elastic laces. Put your shoes on and have someone lace and tie them. Then you can slip them on and off easily -- with the help of a shoehorn, if necessary. To keep things rolling in the kitchen, think wheels. 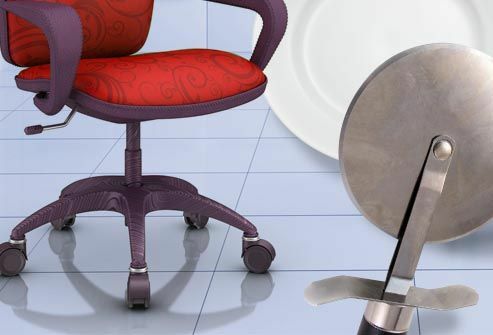 If standing for a long period is difficult, use an adjustable rolling office chair or stool when you chop vegetables or do dishes. A rolling utility cart can help you transport dishes or other items. Even a little pizza wheel can help. Hold it with both hands to cut sandwiches, lasagna, and other foods. Instead of using a clutch-style purse, wear one with a strap you can throw over your shoulder or elbow. Use your hips or bottom to close drawers or cabinets. Carry pots with two hands -- one underneath, using a pot holder. 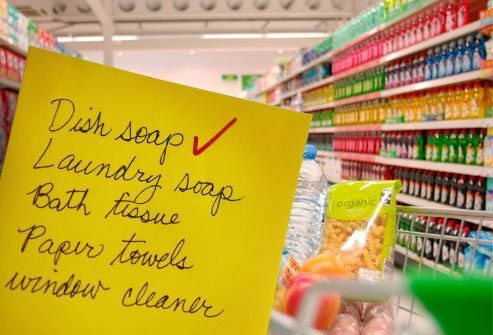 Organize your shopping list according to your path through the store, grouping items that are in the same area. Lean on your cart for support or sit down to rest. Ask for help carrying shopping bags to the car. At home, put perishables away and take a break before unloading more. Squatting when you need to reach something low is better for your back than bending over. It also helps build strength in your legs and hips, which stabilizes your joints. But it can be tough on your knees. To do it right, hold onto a countertop or sturdy piece of furniture and "sit" into a squat, lowering yourself as far as you can comfortably and pulling up with your arm and bottom muscles. Be sure to keep your knees aligned over your ankles. If this is too painful, lean down from a chair, not from standing, for less stress on your knees. 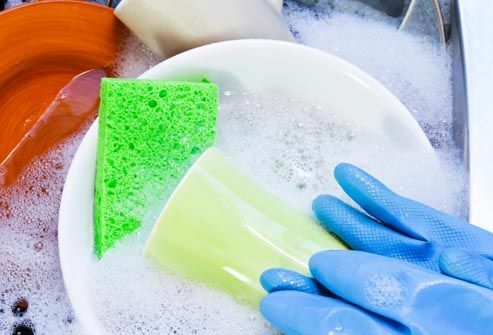 Doing a little bit of housework often is better than trying to do a lot in one day. Plan one big or a few small physical chores for each session and set a time limit. Organize tasks so you can work in one area to avoid going up and down stairs or back and forth to different rooms. And take breaks to relax and stretch. Stairs are a strain on knees and hips. Make them easier to take by going "up with the good and down with the bad." Take one step at a time, leading with your unaffected leg when going up and your affected leg when going down. Lean on the handrail for support when climbing stairs, especially if you have osteoarthritis in your knees. A warm bath or shower can ease stiffness and pain, so make it like a spa experience. 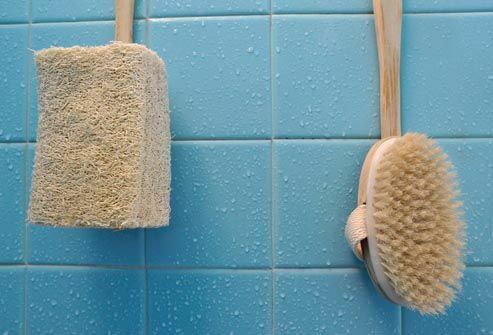 Soap on a rope, a shower mitt, or a loofah can reduce stress on fingers. Place a towel on the edge of the tub to make it easy to swivel in and out. If your shoulders and elbows are painful, wrap yourself in a thick terrycloth robe afterward instead of struggling to dry off with a towel. McLean Care presents "Healthy Living with Arthritis and Osteo – Part 1." Philip Kidd, PT, Brigham and Women's Hospital, Boston, Mass. Phillips, R. Coping with Osteoarthritis, Putnam, 2001.